From hosting a shrimp boil, celebrating holidays, making homemade scratch art paper, sewing gifts and throwing parties to cooking delicious food, you will find it all here at Skip To My Lou. The site is full of free patterns, downloads and I hope plenty of inspiration. Please hang out with me awhile and check it out! 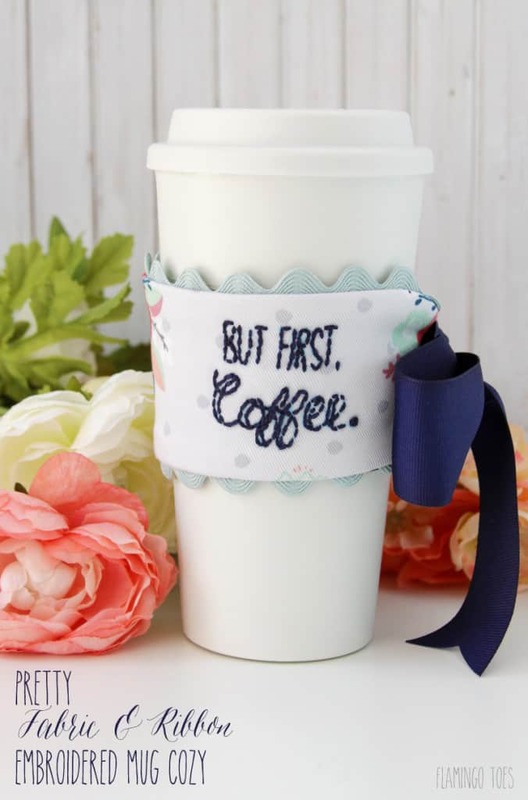 This darling Fabric Embroidered Mug Cozy is sure to make your teacher smile. It is simple to make with the tutorial below. Teacher Appreciation Week is coming up the first full week of May. Get creative with these ideas from some of the most talented bloggers during my Teacher Appreciation Gift Ideas series! All April we will be sharing great ideas. I can’t wait to see what they share. You will be totally prepared with ideas to thank your teachers!? This clever DIY Map Magnets would be fun for kids to help make their teacher. Freshen up the classroom with this DIY pencil banner! Hello Skip to My Lou readers! My name is Beverly and I blog over at Flamingo Toes. I’m so happy to be here as part of Cindy’s Teacher Appreciation series! Teacher’s have a very special place in my heart – my sis is one, my grandmother taught for years, and I even did a little substituting eons ago. (That is a crazy job – subs need to get hazard pay or something.) 🙂 My kids are older now, but when they were younger I loved putting together gifts that had a little something handmade along with something fun, like a giftcard! That is what I have for you today! 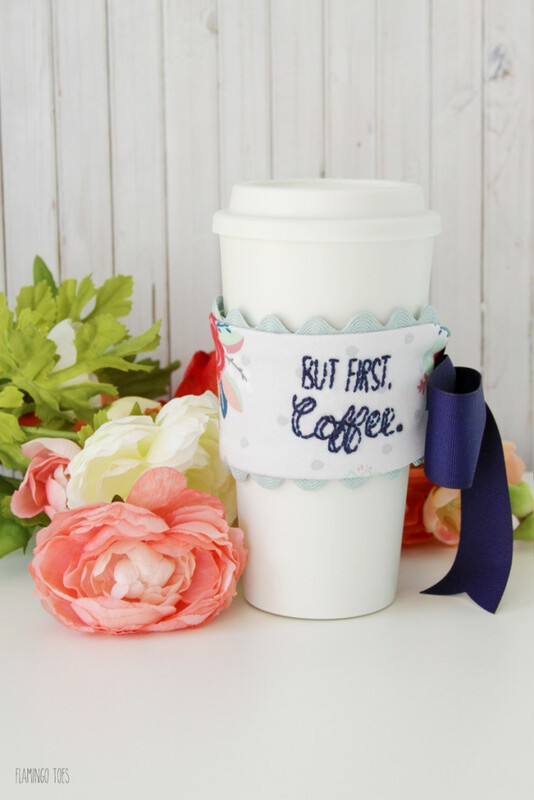 This pretty ribbon & fabric embroidered mug cozy is such a fun and useful gift, and it works so great paired with a coffee gift card. 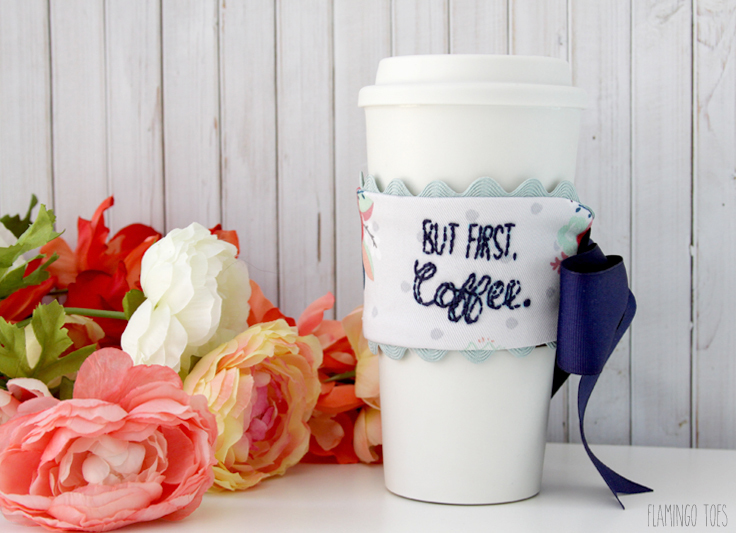 You could even pick up a pretty coffee travel mug and fill it with chocolates too! 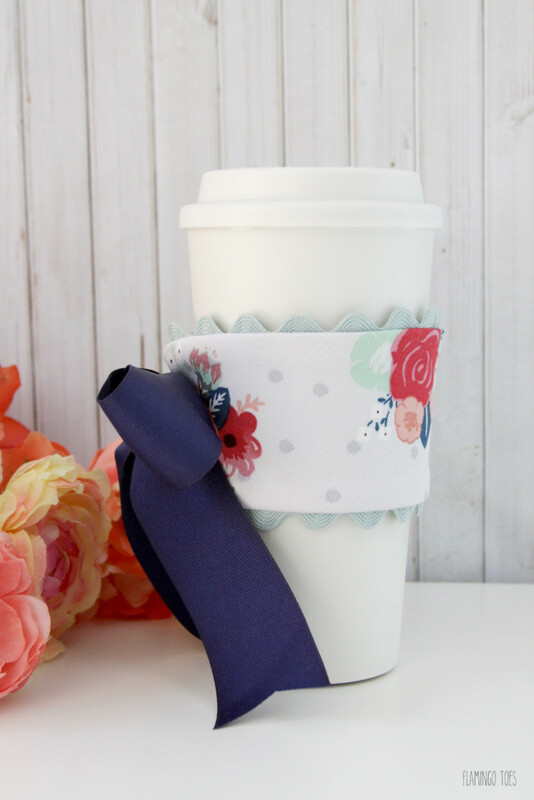 The mug cozy is so pretty, with the florals and ribbon tie. I’ve added a bit of ric rac on the top and bottom too. 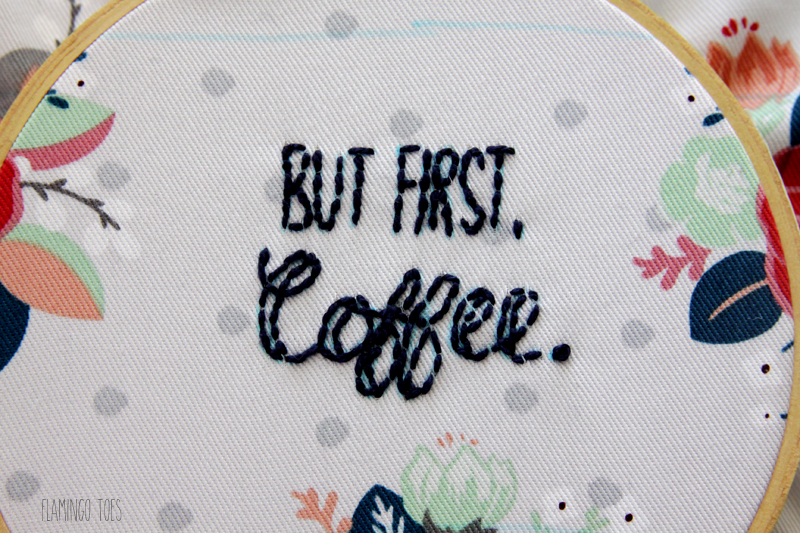 The cozy is embroidered with the priorities – But First, Coffee! 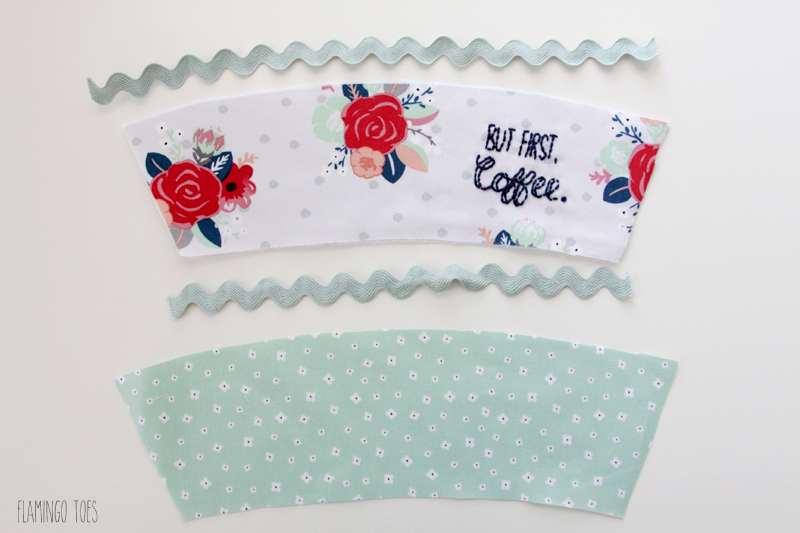 It makes a cute addition to the cozy, but if you pick a pretty fabric you can leave that off! 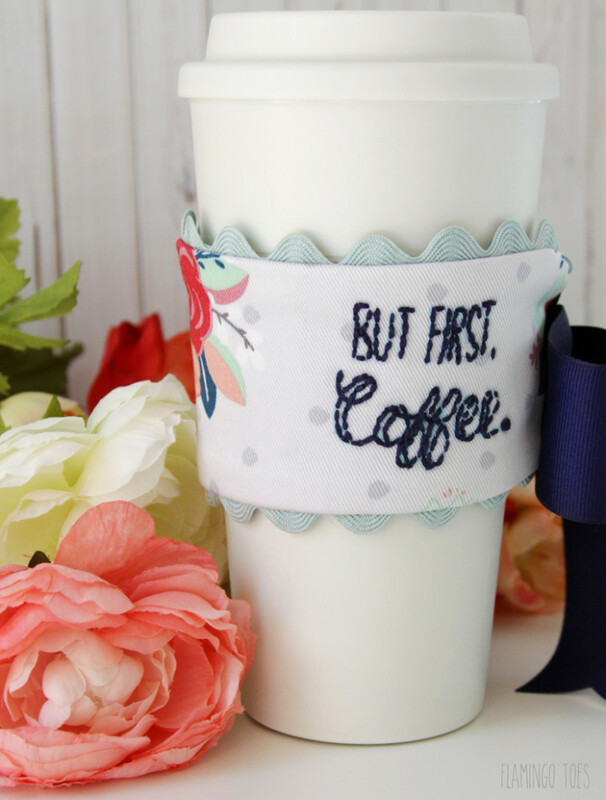 Here’s what you need to make your own Mug Cozy! 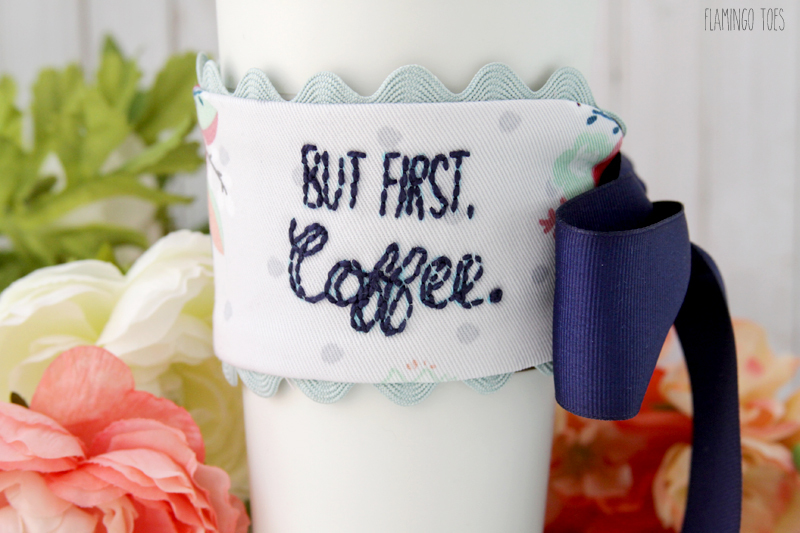 Start by tracing your mug cozy and embroidery pattern onto your outside fabric. If you are using a floral, you might need to shift the pattern around to find the best spot for the embroidery. Place the embroidered section in the embroidery hoop. Stitch the letters of your embroidery with a back stitch. Cut out your outside fabric on the traced line, then cut out the same pattern in your lining fabric and fusible fleece. Iron the fusible fleece to the wrong side of the main fabric. Cut two pieces of ric rac, the top and bottom length of the fabric. 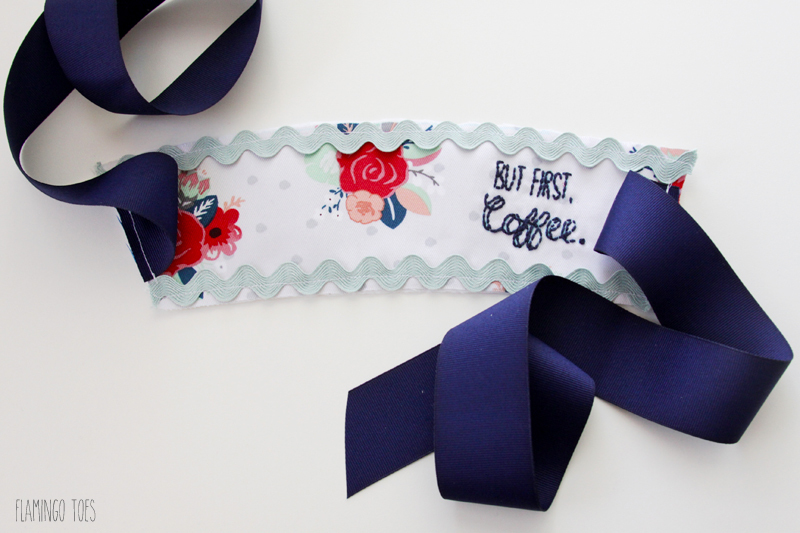 Cut 2 lengths of ribbon, 18″ each. 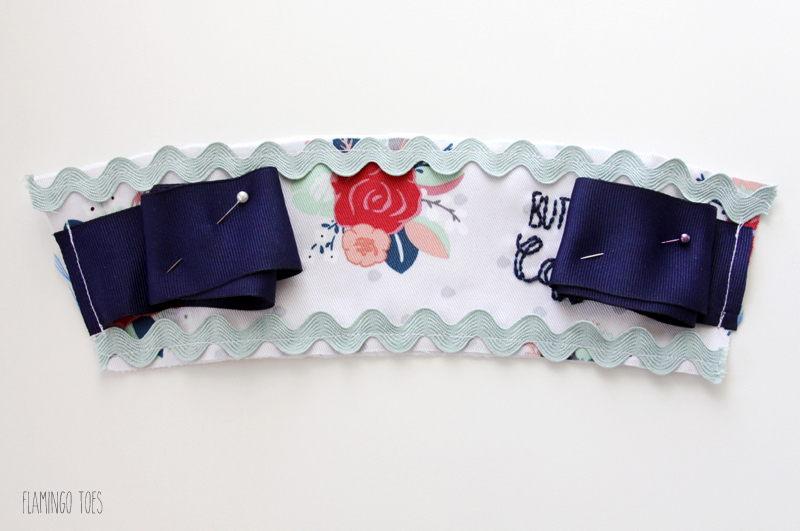 Sew each ribbon to the short ends of the main fabric with a 1/4″ seam. Sew the ric rac to the top and bottom edges of the outside fabric, just inside the scalloped edge of the ric rac. Fold up the ribbons and pin them in place. This will keep them out of the way as you sew the lining to the front piece. Place the lining piece on top of the main fabric piece, right sides together. 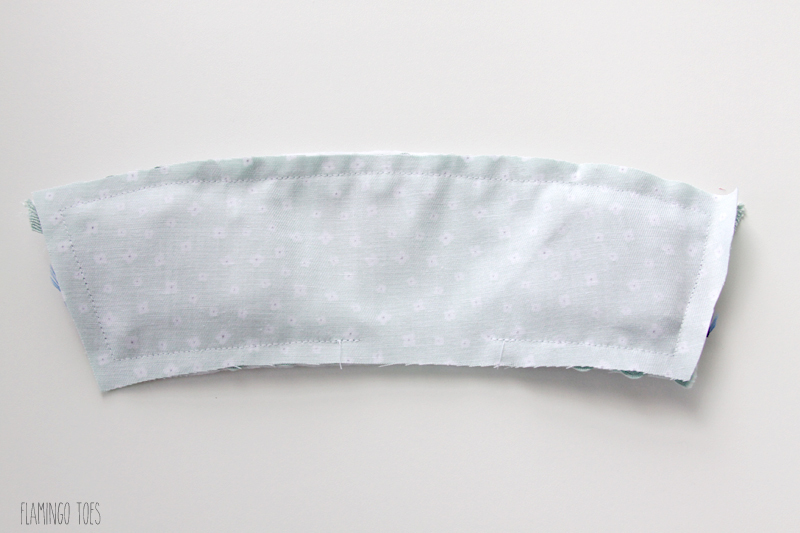 Sew around the edges with a 3/8″ seam allowance, leaving a 2″ opening in the bottom side. Trim the edges and clip the corners. Turn the cozy right side out and press. Hand sew the opening closed. 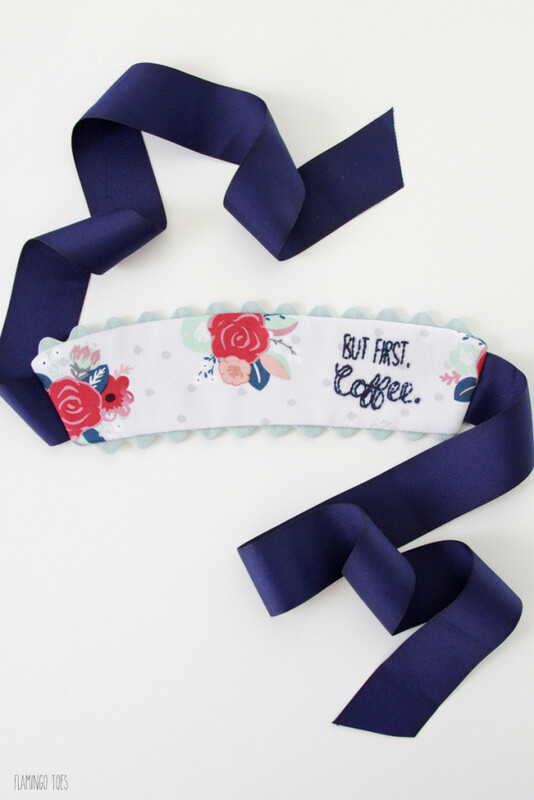 Wrap the cozy around your travel mug and tie in place with a big bow. Trim the ends of the ribbons so they just touch the bottom of the cozy. And you’re all done! I’d love to see a photo if you make any up! 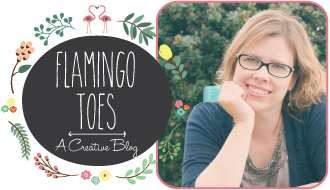 You can come visit me at my blog, Flamingo Toes. 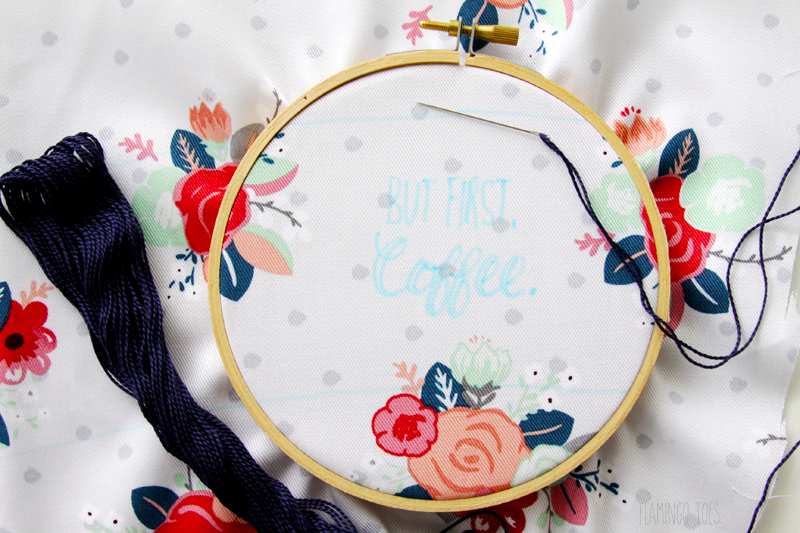 I have lots more sewing, embroidery and home decor tutorials, plus lots of fun gift ideas too! Let me send you my very best ideas, free printables, inspiration and exclusive content every week! Sign Up For FREE!